At this time of the year, with only the strongest of teams having survived the sectional round of playoffs, it’s not uncommon for state tournament bound coaches to broach the subject of chemistry. Typically, they’ll talk about how close they have become to their players, and how their players don’t so much form a team as they do an extended family. Listen closely to Blaine’s Dave Aus, though, and you’ll realize these Bengals really do have a special relationship with their coach. “It’s going to be really sad when they are done,” Aus said about the seniors on his roster. “First of all, you only get one kid like Nick (Bjugstad) to come along, maybe in a lifetime. Good enough to win a state title? 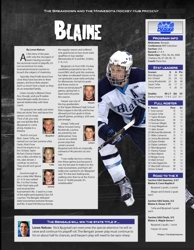 Blaine (21-4-3) was ranked No. 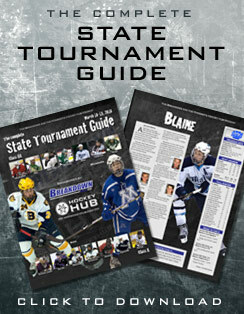 5 in the Hockey Hub’s final state poll and received the tournament’s No. 3 seed in a vote of the eight participating Class AA coaches. The Bengals defeated state tournament entrants Roseau and No. 4 seed Hill-Murray during the regular season and suffered one-goal losses to two more state qualifiers in top-seeded Minnetonka (4-3) and No. 2 Edina (1-0, 3-2). Bjugstad, a 6-foot-4 Mr. Hockey candidate projected to be a first round NHL draft pick this summer, has taken accelerated classes so he can graduate a year early and play for Minnesota. He had six goals and three assists in three sectional playoff games, giving him a team-best 69 points this season. Harper was one of the top goaltenders in the Upper Midwest High School Elite League in the fall, and he has allowed just four goals in three playoff games, posting a .920 save percentage. Scheid, Tufte and fellow forward Jonny Brodzinski, a junior, are joined by star defenseman Tony Larson on a lethal power play that centers around Bjugstad and clicks at a typically unheard of 40-percent success rate.